FixOnClick.com - A Services-Matching Platform to Help Fix your Services Need Easily. Stop Searching, Start Fixing. DUBAI – October 9, 2017 – UAE’s services industry is about to be revolutionized with the launch of FixOnClick. It is the latest services matching platform which helps users meet their everyday household requirements with a few clicks. Fixonclick’s aim is to simplify a normal person’s life by giving them options. The portal was founded by noticing the struggle in the market for any simple milestone in life such as Wedding, Relocation, Events, and many more. Such requirements should be full of choices with intelligence on market average prices along with a trust that they are verified Service Providers. With 1400 Service Providers in 45 Services within 5 months of Beta Launch, Fixonclick gives customers the option to choose from multiple quotations. Whether you’re looking for a cleaner for your home, want to hire photographers for your dream wedding, or need to get your car fixed, FixOnClick makes sure your work gets done without the hassles of traditional means, like surfing through online directories page after page or running from shop to shop and then getting higher estimates for your requirement. On FixOnClick, the customer can browse through the many services and select the services they need. Once the requirement is posted, they start getting multiple instant quotations for their requirement. The customer can choose a service provider based on the cost, ratings and distance. Creating profile, chat between both parties, and reviews for both customers and service providers are a few of the other features on portal. Customer can also request for the consultation charges, for services like interior design, exhibition stands or landscaping. FixOnClick also envisions to empower the SME industry in UAE, which accounts for 94% of total businesses, to achieve their goals by providing them all the tools, at a fraction of the usual costs. Although the SME’s have the lions share in terms of number of businesses, they often struggle in this region due to lack of Business Intelligence Tools, non-standard business processes and extremely high cost of customer acquisition. Currently, all service providers on the platform receive qualified leads, are able to send free quotes, get options for value added services such as business intelligence, deal insights and an intuitive CRM dashboard to work on, which most SME’s are unable to acquire. 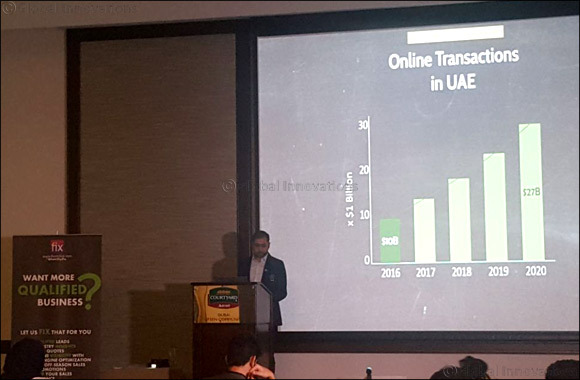 “Most of the SME’s in the UAE are challenged because of market’s transient nature. Even if they get business from local brokers, they end up giving a major share from their profit. Fixonclick is here to empower SMEs and we ensure that the Service Providers keep what they earn. 87% of Service SMEs do not market online because of which there is a huge gap between Service Provider’s prospect and the customers who are missing out on Professional experts. We are here to bridge that gap”, says Erum Rizvi, Co-founder and CMO at FixOnClick. Having worked most of her professional life in tech powerhouses, Erum feels that her upbringing in the UAE enables her to empathize with the struggles of having her requirements met at the right price by a qualified service provider. “We love getting choices, we love to have an idea of prices before we make a decision, and we do that in normal purchases, so why not in E-commerce of Services? Fixonclick lays the foundation of trust between Customer and Service Providers for those choices.” Says Erum.